Summer is on the rise, so does our worries to find the best quality lawn collection for our summer wardrobe. Soothing colours and inspiring prints are hard to find yet some brands are providing the both under their labels. Flora is promising the same this season. 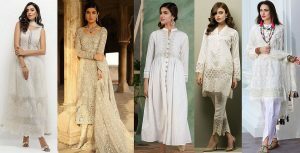 This rising fashion label of Pakistan has taken a grasp over clothing markets of states, and a lot of women drawn towards the innovative and creative designs this corporate is providing. In the busy streets of Lahore and Pakistani’s biggest textile centre Faisalabad, this brand is competing well with its high production standards. Today we are going to discuss and review the Flora Premium Lawn Designs Collection 2017 Best Pakistani Lawn Suits. This year too, Flora has brought forth some mesmerising prints for young and old, in a variety of styles. It has launched three different range of summer lawn collections to encompass the need for everyone. These mainly are the Premium lawn, Gold limited edition and Emaan lawn collection. Each has its defining features and diving in more into details will let you know which one would suit you the most. 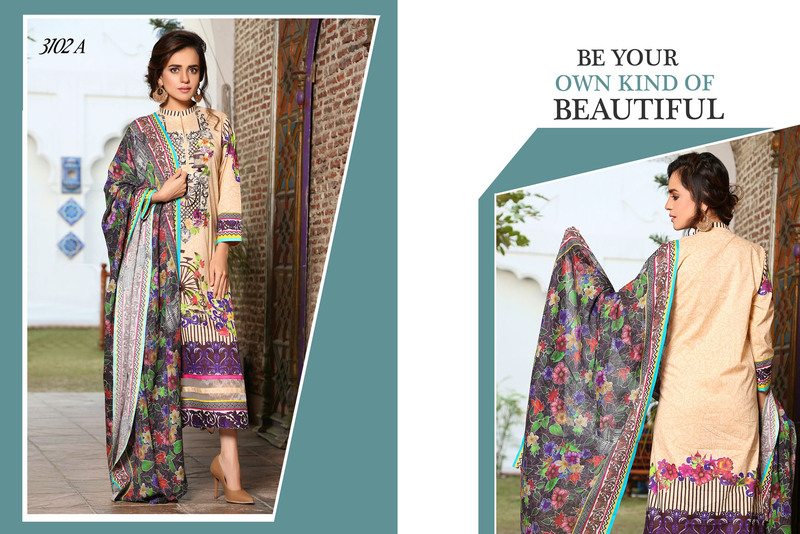 The Flora premium three piece lawn collection has the perfect blend of hues with prints. It satisfies your need for everyday wardrobe. Working women can carry it to work in style, girls can wear it outside, and at home, you can also nail your outlook with this best Pakistani lawn suits collection. 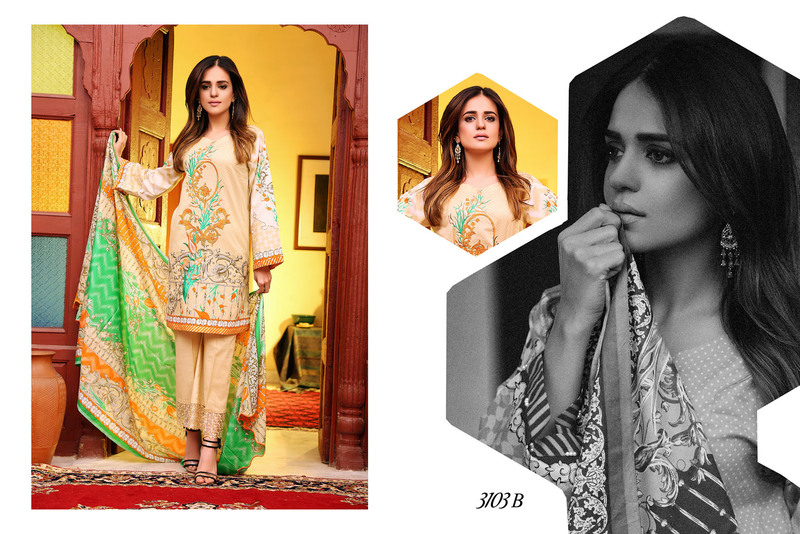 The price range of this premium lawn collection is 2,990 PKR for all the designs. Which is much affordable with high-quality prints and comfortable fabric. Digital Urban prints as already are in the game; flora has used this particular print to give a background to their basic layout. They used such prints to give the suit a classic urban touch, while the use of beautiful floral prints all over it. And certainly adding much charm to the dresses. 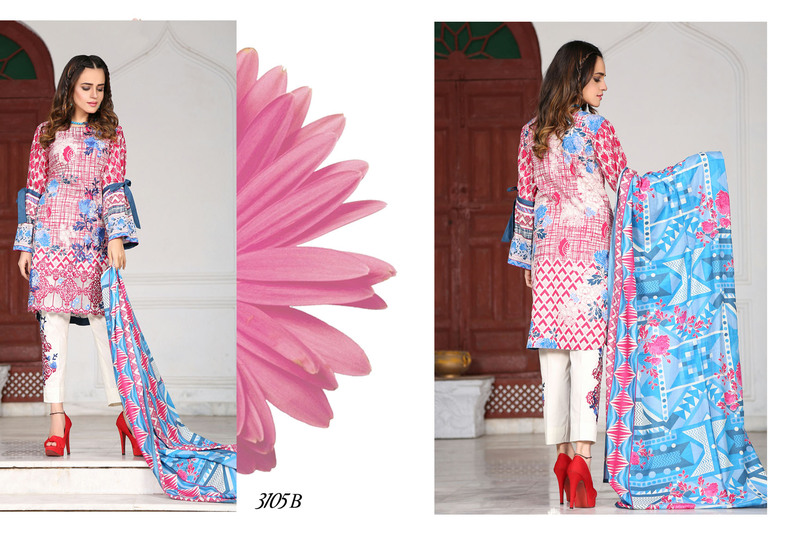 Dupattas in mixed chiffon are richly printed with a mix of colours and patterns. Here the colors are complementing the printed designs of the shirts. Soothing delightful prints are something we all desire for summers. Well, flora lawn has worked it out for you. It is giving you the best of soft prints in mellow pastels colors; even the prints are kept in low and medium tones to capture the hearts of customers. 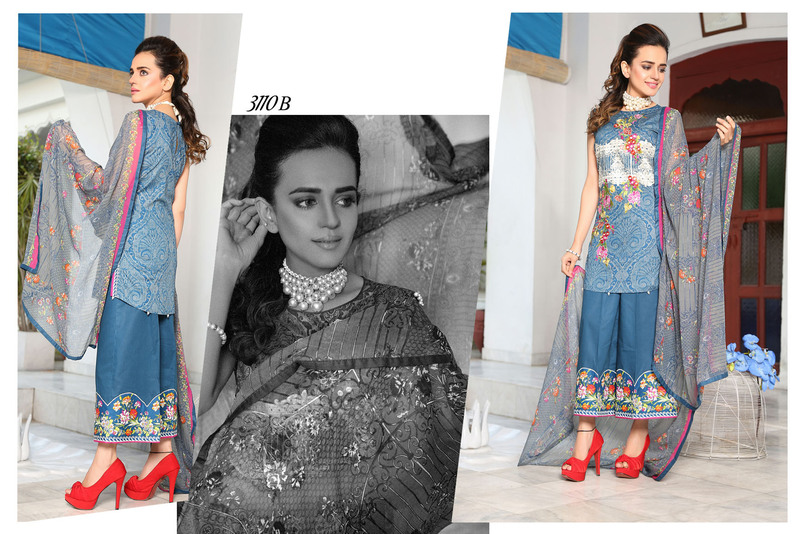 These suits have light chiffon dupattas to complement its low-key designs. Central prominent motif patterns are another way to amplify the beauty of the shirt. If these motifs are paired with side motifs on the bottoms, the suit becomes an emblem of perfection. The base colour for these kept incredibly soft while the prints and patterns are contrasting and tastefully spicing things up. For all the formal occasions, you can try the Flora Premium Lawn. In this blazing heat outside you can’t prefer something fancy to carry around yet you do need something worth admiring to wear whenever you go out. Heavy dose of thread work is one of the best features of this flora premium lawn collection. Neckline embroideries, side panel embellishments or borderline thread work, everything style is there to add more diversity to the embroidered series of lawn pieces. The lawn suits have some heavy but light weight embroideries. Perfect for summers. Which is making these dresses highly suitable for carrying it on some special occasion. Here the combination of hues is also tempting, the heavy dose of beige in thread work is used for the fronts, or around sleeves or border lines. Have a look on the below-posted image gallery and get inspired by the latest Pakistani lawn suits designs. Go and shop your favorite piece from the Flora Premium lawn assortment. Have a good day!